Welcome to TSRI's Summer Grilling Celebration! We are enjoying a whole month of grilling and summer dishes. Today, we are talking serious burgers, seriously! 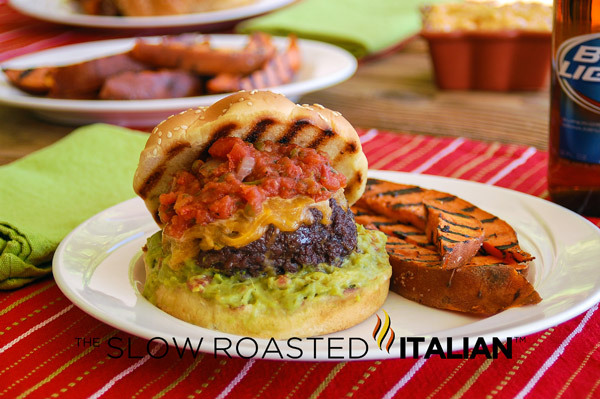 This burger is a FIESTA of southwestern flavors, some of my favorites wrapped up into one amazing burger. Believe me when I say, I ate the whole thing!! I could not stop myself it is so good. This burger is incredibly moist with a nice little kick. Served with Grilled Sweet Potato Fries, this burger is a member of the clean plate club. I tell you there was not even a crumb remaining on my plate! Form beef into 1/2" patties, making a slight indentation in the center of the burger to prevent it from doming up in the center. The indentation will rise as your burger cooks. Sprinkle each patty with 1/2 teaspoon Tex-Mex seasoning. Gently rub seasoning into meat. Grill until golden brown and slightly charred (about 5 minutes), turning once (cook for 4 minutes on the other side for medium). Avoid pressing with a spatula, you don't want the juices to escape! Add cheese for the last minute of cooking. Butter buns and place on grill (inside down) for about 1 minute, until they are golden brown with grill marks. Remove buns and prepare with 1/4 cup guacamole on the bottom bun. Place burger on top and 1/4 cup pico de gallo on top. Serve with Grilled Sweet Potato Fries! Unbelievably flavorful and so good you will wish you had a second stomach. That is one seriously loaded burger! No pun intended. Seriously loaded and unbelievably delicious. Chad even enjoyed this one, minus the guac of course. I'm not usually a big burger fan but this does sound terrific. Your post is so well written, very cute! Thank you Tricia. So, you are not a 'big burger' fan or a big fan of burgers? I love burgers at home. I can't get enough some times I appreciate the compliment. Holy cow, that burger is gorgeous!!! Wish I could take a huge bite out of it right now. Andddd sweet potato fries? You're killin' me. One bite is a bit of an issue, thank goodness we are out of the ingredients now this burger is soooo good it is hard to put down. Maybe I will make a slider version next time. I always go by the old adage 'never eat anything bigger than your head', but for this burger I'll make an exception! 93/7 ground beef? Won't a higher fat content make a juicier burger? DB, I completely agree. I would recommend 80% for the best burger. I am trying to cut back a little and made these last time with the 93%, but both are absolutely amazing!!! Now that is one really nice looking burger! Dang, now that is a burger!! Looks incredible! That is a great looking burger! Awesome flavors - yum!! I'm so glad I found this recipe before I put my grill up for the winter. These sound delish! These will be on the grill tonight!